It’s now seven points little over a week for Dave Frecklington’s Matlock Town who moved out of the bottom three spots in the Evo-Stik NPL Premier Division. An Adam Yates own goal on 5 minutes saw the night begin badly for the Gladiators, but Marcus Marshall with a brace and a Craig Westcarr penalty turned the tables in the hosts’ favour. 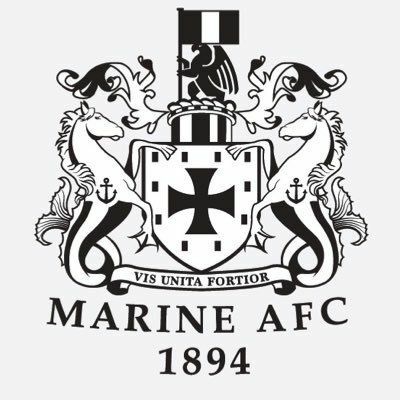 Tuesday night’s victory over the ten men of Marine was a scrappy one with the final scoreline a little harsh on the Merseysiders but Matlock won’t worry a great deal about that. For probably the first time in many weeks, the ball ran for them but that was down also to sheer hard work and tenacity, qualities that the Gladiators certainly needed against the bright Liverpudlians, fresh from a fantastic 3-2 FA Cup win at National League North and looking for a third successive league win. The match started fifteen minutes late due to Marine’s late arrival after traffic congestion en route to the Proctor Cars Stadium..
Tom Davie had initially cleared off the line in the build up to Marine’s opener but the busy visitors kept the attack boiling and the unfortunate YATES partially blocked Liam Hynes’ diagonal strike but could only deflect it past Russ Durrant. Not the start most of the 310 crowd wanted, particularly as Marine had started much the better side, quicker to the ball and asking most of the questions. Thankfully from the Matlock viewpoint, the lead did not last too long, seven minutes in fact, as Davie’s gigantic throw from the right was back headed across the six yard area by Lee Beevers for MARSHALL to run in and nod home from close range. A simple but perfectly executed goal. The equaliser lifted Matlock who attacked down the left, a Craig King free kick being cleared awkwardly, Davie having seen a back heeled effort blocked. Kenny Strickland curled a 24th minute free kick harmlessly wide before following a neat move two minutes later, Danny Mitchley shot over the bar with Matlock knowing they had much to do to gain the win they badly needed. But that task was made somewhat less problematic when Strickland and goalkeeper Martin Fearon got themselves in a muddle from Nathan Whitehead’s long searching cross to the far post. Marshall seized on their hesitancy and Strickland caught him, referee Richard Eley pointing immediately to the penalty spot. WESTCARR easily stroked the ball home to give his side a 32nd minute lead. Shortly afterwards Yates was within a whisker of heading in King’s free kick from the left and Marshall looked to be pushed in the box, again by Strickland for possibly a more obvious penalty shot than the first spot kick, the referee this time waving aside the Matlock appeals. Beevers, who organised the Town defence magnificently, did well to tidy up from a dangerous Mariners attack before on the stroke of half time, a well worked corner resulted in Brad Beatson’s downward header bouncing inches past a post. Within four minutes of the restart, Craig Carney was shown a straight red card for a poor challenge on Davie but for the next half hour it looked as if it was Matlock playing with a man less. The Mariners enjoyed the lion’s share of the play but for all of their dominance, Ross Durrant was only tested once when he slipped in diving to field a low skidding shot from Steven Irwin, smuggling the ball away for a corner. Matlock’s defenders remained resolute although Beatson, Davie and substitute Jordan Lemon all collected yellow cards for foul challenges. It was only in the later stages that Matlock rediscovered their attacking rhythm, captain Cleveland Taylor pulling his shot wide from the edge of the box having been found by King. Lemon drove across the face of the six yard area before on 81 minutes, MARSHALL made the points virtually safe with a sudden burst of pace as he outpaced Danny Shaw to thread a calm shot past the unprotected Fearon for his 5th goal of the season. Marshall robbed Shaw who recovered heroically to stop the Matlock number ten shooting for a hat-trick and Jake Green inadvertently headed a Whitehead shot over the bar before with the last kick, Marshall curled wide when brilliantly placed to latch on to a suicidal back pass from Mitchley. It had been a much needed victory, not convincing but sometimes you have to win ugly. Frecklington and Matlock will take that. One thing that could not be questioned was their commitment and togetherness which shone through like a beacon through the floodlights on a calm Autumn night.